When we first released Ossuary, it was to storefronts that didn't have an automated game update system: Humble, IndieGameStand, and Desura. We knew there would be updates to Ossuary (the Mac release, if nothing else) and that we couldn't rely on players to follow our fledgling studio on social media. So we made our own unobtrusive update system. If you play the game on one of those platforms, you'll see updates. If you don't play Ossuary anymore, you won't be bothered. The system is pretty simple: we power this site with Django, a Python web framework. In addition to the blog and CMS, we wrote a little app that has a collection of Applications and Updates linked to them. Each Application gets a unique URL that our games can check for information. Updates themselves are a message, a version, a link, and a release date. We can push these messages out without updating the code in our games. When you load Ossuary, "The Hodge-Podge Transformer", or (soon!) 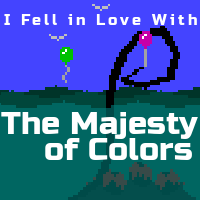 "The Majesty of Colors", the game calls its unique URL to grab the latest update and show it in-game. When a game is new, that might just be a message. When there's an update or sale, we link it to a page, usually a release page or blog post with details. 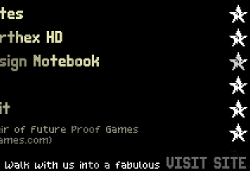 If you play our games on Steam, Android, or iOS, you'll still see the update message and can click through to see the linked notes, but the platform should do its own upgrade. This makes the system redundant on those platforms, but it isn't harmful. The remastered version of "The Majesty of Colors" will be released in mid-2017. For more information, see the website or our presskit.